The Agriculture Opportunities in Missouri site serves as a resource to help Missouri producers learn about alternative agriculture opportunities that are available and assess these opportunities based on a given producer’s local market opportunities, level of expertise, financial position and available agronomic and machinery resources. Currently, the site shares information about a diverse mix of cover crops, bioenergy crops, specialty crops and other alternative crops. In the future, however, look for an expanded site that features information about other alternative agriculture opportunities. 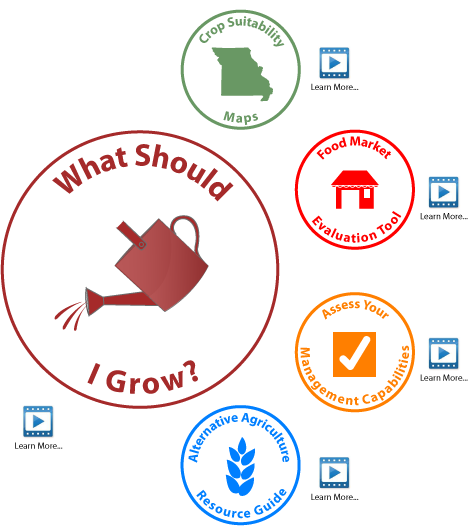 Using the icons to the left, you can access the five Agriculture Opportunities in Missouri tools. Click through these five tools to discover more about Missouri alternative agriculture opportunities and explore whether a particular opportunity would be well-suited for your farm!